Watch this space for more New Zealand installations highlighting first class stacking equipnment from Europe installed in apartment complexes – offices and retail complexes throughout New Zealand. 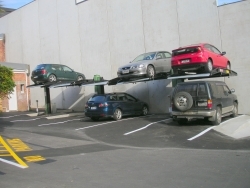 Our company has been asked to look at better and safer ways to park cars and make better use of car parking spaces after the Christchurch earthquake. More to come. Creative Auckland developer required additional car parking for Inner city site underneath Historic redeveloped Hotel site. By using the German pit system additional car spaces created for independent parking. 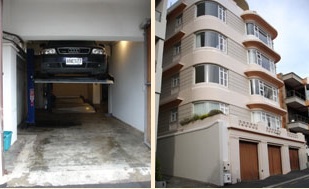 This exacting installation in Oriental Bay required us to solve a long and narrow garage area where four cars were parked by apartment owners which required cars to be moved when someone wanted to depart. With limited head height we installed “four drive through stacking units”. This allowed free access underneath to arrive and depart totally independently. 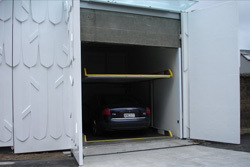 Hawkes Bay hotel wanted to access mezzanine level for an additional 15 car spaces where ramping was impossible. A simple car elevator system was installed to solve the problem. This ultra modern spectacular Auckland home requested the “Pit system” to park two cars totally independent. With a tight land template parking the cars in any other way would have dramatically inhibited much sought after living space. This unit is the Woehr-440 Pit system and is fast becoming the big seller in New Zealand for independent car parking. Recent installation and a first for Auckland was the completion of a 16 car “double pit system-The woehr-Parkilift 440 series” which allowed the parking of an additional 8 cars and allowed all apartments to be allocated at least one car space in this very narrow building project. The only alternative would have been a costly ramping system to another level below with massive excavation. Owner of one of Hamilton’s finest apartments was provided with two car spaces however they required 4 for their own use, and for those of their visitors. The basement area had sufficient height to install 2 stackers which now provides 4 car spaces. Developer wanted to provide two cars spaces per apartment on this tiny land area and this was only possible with the installation of high quality bolt down stackers. This enabled a quick sale of the apartments. Additional height of 1.5m was required. These prestigious Oriental Bay apartments had a land area of 50sqm for parking however with excavation and a small pit system enabled the developer to provide 2 independent car spaces per apartment instead of one adding considerable value and saleability to his project. Creative developer wished to create 10 car spaces where only 5 were possible. The top cars parked on these simple bolt down stackers are utilised by staff with their customers parking underneath. Problem solved for minimal cost. Recently refurbished a 1920’s Villa and raised the roof line to provide space for an additional car using a simple stacking unit and adding over $60/70k to the value of the house. Cost to client $13k.